Daily Mirror - They don’t want even dogs sniffing around! They don’t want even dogs sniffing around! A section of white collar ones working at a strategic point monitoring imports and exports have put down their foot against a proposed move to set sniffer dogs to detect narcotics being smuggled into the country concealed in cargo shipments. These white-collar ones apparently working on a common agenda, which appears to form part and parcel of a sleaze network, look on the workplace as their exclusive territory and would not tolerate collaborative assistance even from another State Agency, they say. 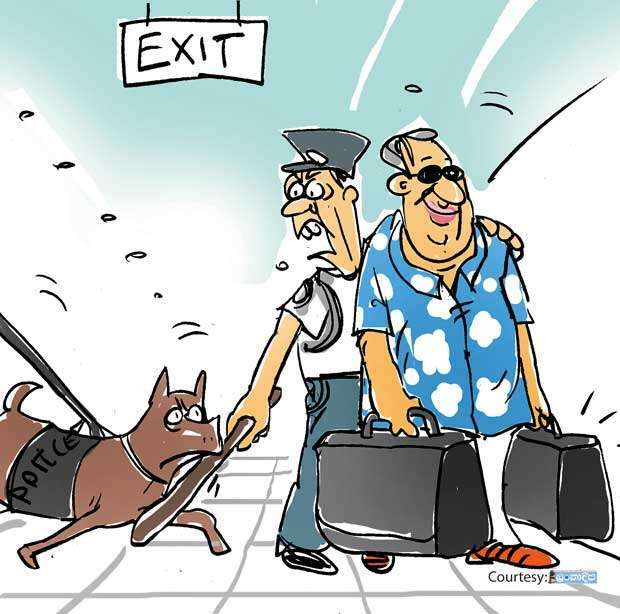 These worthies had raised a howl of protest when a high political authority recently proposed that the trained sniffer dogs be deployed at strategic points at the Colombo Port to frustrate attempts to smuggle in dope to the country. Some of these white-collar ones have reportedly made it a practice to collect ‘santhosham’ from importers for releasing cargo shipments and they do not tolerate the presence of outsiders in their ‘territory’ even in an official capacity, they say.